Creating content is hard work—and juggling all those tasks and responsibilities keeps even the most seasoned professionals on their toes. Luckily, many industry leaders have created helpful resources to make the content chaos more manageable. From top tips to eBooks, here are 14 guides that every content marketer should bookmark. 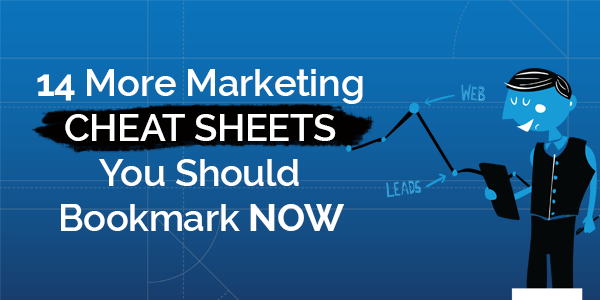 The Content Marketing Institute is a valuable resource for the industry, and this is just one of its excellent cheat sheets. If you’re getting ready to put your content strategy on paper, this guide should be required reading. It’ll help set you on the right path and improve the effectiveness of your campaigns. Everyone secretly hopes to have their marketing campaign go viral. While you may not be able to engineer an Internet sensation every time, KISSmetrics has analyzed the elements that go into most viral content. Even if you don’t get millions of views or shares, these ideas will still up the quality of your material. It’s easy for B2B marketers to assume they know everything about each other. But when you want to reach your peers and encourage them to share your content, you can’t leave anything to chance. This infographic breaks down what B2B marketers are most likely to read and share so you can reach out to them in the most effective way. Marketing automation can yield great improvements to your team’s results, but you still need to make smart choices in how you implement these changes. With this resource from Pardot, you can streamline your automation by setting smart goals and maximizing workflow. Any major event at your company has a different set of marketing needs. If you’re gearing up for a product launch, this guide will help you hit all of the important points. Get all of the insights you need to build a content strategy that will keep people aware and excited about your business’ latest release. The various departments within a business need to be able to work together in order to achieve the best possible success. Get your marketing and sales teams in sync with these tips from Salesforce. Many marketers are tasked with generating leads for the business. To make sure you’re on the right track, Marketo has a comprehensive list of A/B test ideas. This cheat sheet will ensure that your efforts to bring new customers into the fold aren’t just shots in the dark. No matter how long you’ve been in the business, it’s worth revisiting the basics every now and then. Is the content you’re making really reaching and impacting your desired audience? Feldman Creative has the insights to make sure you’re on the right track. Striking images are a must for your content. It might be the perfect photo to accompany a blog post or a PowerPoint presentation of research data. In any case, you’ll want to nail the design of your visual content, and HubSpot can help. This set of free templates can give extra pizzazz to your infographics, eBooks, and calls to action. Marketers need a constant influx of photos, but don’t always have access to an art team or a skilled photographer. Fortunately, there are sites where your team can find free and legal pictures for your business needs. Here’s a collection of seven favorite photo resources. Visual representations of data should be easy to process and easy to share. To make sure that any charts in your content check those two boxes, review Visually’s list of seven common errors. From simple math mistakes to smarter choices in the display, these will help every chart to shine. Social sharing is often a key factor of success in a content marketing plan, but it’s a big investment of time to nurture those conversations and prep posts. Being able to save some time on the tasks happening behind the scenes can be a big help to your social and marketing teams. Hootsuite has made six templates available to assist with everything from planning an editorial calendar to correctly sizing social images. Execs always want to know about the bottom line. If your marketing strategy involves social media at all, then make sure that you collect data for these important metrics. You’ll be able to deliver the information that the higher-ups need to hear and prove your worth to the business. Whether you’re focused on paid search or email, make sure that you and your team cut through the vanity metrics to focus on the numbers that really matter to your performance.